Technology has disrupted every part of our day to day lives. Regardless of whether you are the CEO of a charity, a construction business owner or a retail entrepreneur; embracing the future of business is never going to be easy. There was one thing in common that I noticed after working with both technology startups and global brands when helping them go through a digital transformation. This was the human element of a “digital mindset”. Everyone was talking about the “WHY you should change your digital mindset” rather than the “HOW”. Before I share with you the “how” behind developing a digital mindset, let me just give a brief breakdown of the “why”. Going through a digital transformation means that you are meeting your business growth challenges head-on, and understanding your customers needs, technology available and all of the moving parts a successful business should be aware of. In doing this, you will better understand the opportunities available to you as a business online, and also give your brand the best chance to succeed. After understanding the above, I want to take you through the process I went through so that you, as a business (regardless of whether you are a start-up, SME or corporate) can really benefit from developing a digital mindset shift. I have spoken at lengths about the technology side of going through a digital transformation in previous blogs, but mindset is just as important. Although the technology side is the exciting part where you get to understand about Artificial Intelligence, robots and Machine Learning it’s not where the real learning and development takes place. Here are two important mindsets to consider when going through this transformation process. This, to me, is all about working together as a business in a collaborative approach. There has to be cooperation, open-mindedness and respect within a business. Everyone will have a different point of view, and it’s about bringing all of this together to build trust online. You will find individuals that do not want to embrace change, and will avoid going through any kind of mindset change. This is called a fixed mindset. The complete opposite of this is a growth mindset. Taking every opportunity, learning, experimenting and overcoming challenges are what can be expected if you adapt to a growth mindset. I understand that going through a mindset shift can be tough. I want to share with you three key things that have helped me go through my shift from “why” to “how”. If you want something to be your mantra, and you are developing a digital mindset, you need to have discipline in building new habits. To achieve something new that is going to impact the way you do business moving forward, you need to set goals, be disciplined and forget your old habits. You are going to have to step outside of your comfort zone when developing a digital mindset and this will call into question your vision and business passions. Start again. With a digital mindset, write down all of your business visions and really look at how this is going to change the way you do business moving forward. This could be a huge change for you so the best advice I can give is to just take three small steps every single day. This could be taking a simple action to avoid feeling overwhelmed or unsure of where to start. What you are going to experience is something completely new. Part of the “how” is developing a new YOU, and there are qualities that you are going to want to embrace to help you with this process. Accepting new ways of working, and adapting to change are going to be two key aspects of a new mindset shift. The digital landscape is ever-changing, and you are going to need to adapt with these changes. There are going to be decisions that you need to make regardless of whether you are a start-up, SME or corporate that you will not have all the information you need. You will have to be open to ambiguity, and fill in the gaps through debate. To go beyond the role you’ve defined as work is going to be key moving forward. Seizing all of the opportunities in front of you, and allowing curiosity to be your tool that allows you to explore is going to be a step in the right direction. For me, this was one of the most important parts. Having an open conversation with my team, and allowing for collaboration in the workplace is a way to bring in different experiences, and ways of viewing a certain situation. All collaboration must be inclusive. People who think alike, are unlikely to provide innovation within a business. Therefore, diversify and allow for a digital mindset to go beyond your comfort zone. To finish off this article, I want to share with you three tips to help you implement your digital mindset shift. Data has always been seen as something that is expensive, clunky and overwhelming. You are going to go through an experimental phase with your business when adapting a new mindset and without analysing the data behind this, you won’t know what is working well. Businesses are now investing in products for data purposes to achieve a deeper insight and more opportunities moving forward. Do you remember the days when testing an idea was both slow and expensive? With your new mindset, think about how you can keep innovating. You can still develop the MVP, and create a viable product but make sure you are keeping an eye on the digital landscape. It used to be about “working the algorithms” to get the sales you wanted for your business. We are in a customer-facing economy and what the customer wants, is what your business needs to be creating. As your customers needs change, so must your business. 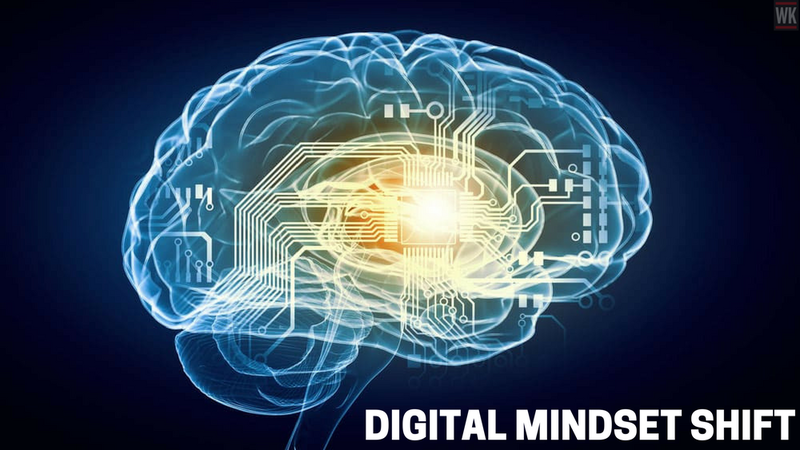 Don’t be afraid to develop a digital mindset shift. Make a plan, and set a date. Know that your motivation to do this may hit a few road bumps along the way but think about your business, and giving it the chance it needs to be successful in the digital age. What changes are you going to make today when developing a digital mindset shift? Thanks for this. Knowing the customer and measuring reach, engagement and actions by the customer seem so critical. Looking forward to your thoughts on the best methods for entrepreneurs to lay down the core measures for success. Hi Warren. Another great piece. As usual, lots of food for thought. I find that the more I learn new things (like in your last webinar when you talked about the demographics that use specific social media)….the more I chase further information to understand better and explore opportunities moving forward. This lands me in a never ending loop filled with new and interesting links that I then have to research and learn about. The problem am having is reeling it in because I find am going over board and experiencing a system overload and having less time for other things. I know exactly what you mean Oby and I used to be in that place when I first started 10 years.